Radio Frequency Technology In Your Own Home! DermaWand® uses the same technology as the big radio frequency machines that doctors and medical specialists use for treatments to help manage the signs of premature aging. The difference: DermaWand® uses lower amplitude that’s perfect for everyday in-home use. Like the big machines, DermaWand® provides instant stimulation, thereby providing a massage effect while at the same time delivering thermal energy and enriched oxygen. The results – younger looking skin with only 2 three minute treatments a day. Best of all, you can do it in the comfort of your own home at a fraction of the cost of going to a doctor! Can you believe this is only ONE photo!? To prove that DermaWand® works, creator Christina Boves used DermaWand® on only one side of her face for 12 weeks. And the results were truly unbelievable! Combines the radio frequency effects of thermal energy and instant massaging stimulation – This helps the skin appear more toned and tightened, smoothing out the appearance of fine lines and wrinkles. DermaWand® also oxygenates by creating enriched oxygen that cleanses and purifies, reducing pore size while breathing new life into your skin’s surface. Reduces Enlarged Pores & Uneven Texture – Oxygenate that pitted appearance for a fresh new look. No cover up required! Stimulates Saggy, Slackened Skin – Instant stimulation at 100,000 cycles per second helps the skin appear more lifted, toned and tightened. Reduces Puffy Eyes – Pack your bags! 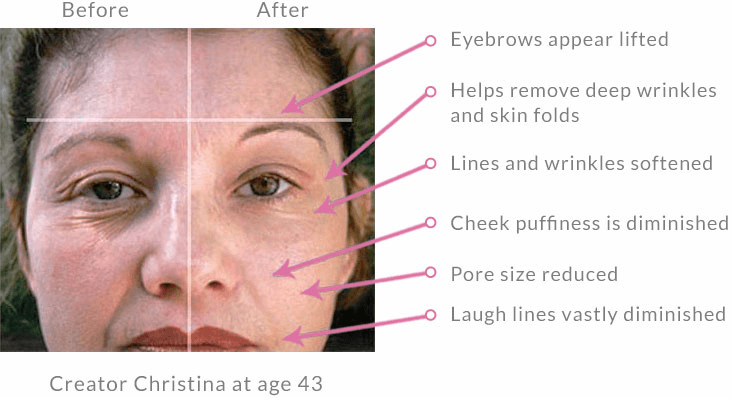 Wand away that tired, saggy, puffy look and diminish the appearance of excess folds. What a relief! The gentle microcurrent delivers thermal energy to the dermal areas under your skin’s surface and increasing dermal skin temperature may help support your skin’s natural healthy look. DermaWand® delivers gentle microcurrent at 100,000 cycles per second, producing a massage effect. Massage helps improve circulation and bring fresh blood, oxygen and nutrients to the skin’s surface. DermaWand® gives off enriched oxygen which bathes your skin while you’re using it. You’ll recognize the smell; it’s that fresh, clean “after a rainstorm” fragrance. Enriched oxygen will help breathe new life into your skin’s surface and with DermaWand®, you will see a reduction in pore size.